Normally swords are a bit out of place at the Winter Olympics — although I would pay good money to see the curling teams duke it out on the ice — but at the Vancouver games the Integrated Security Unit announced that Sikhs who are participating in the games will be allowed to wear kirpans — a ceremonial sword considered a sacred religious symbol — around the venues. Anyone wearing a kirpan will be required to inform security before entering any of the venues, providing they follow these stipulations. All articles — including unshorn hair, turban, comb, steel bracelet, kirpan and soldier’s shorts — of faith must be worn. The maximum total length of the kirpan, including the sheath, may not exceed 19 centimetres with a blade of not more than 10 centimetres and a handle of five centimetres or less. 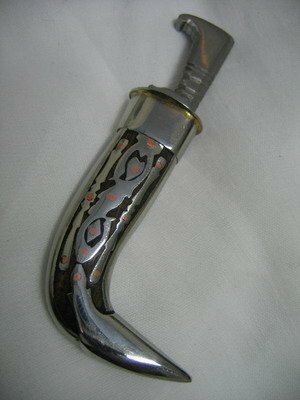 The kirpan must be worn in keeping with Sikh traditions, including being secured into its sheath, attached to a fabric belt and worn across the torso. The kirpan must be worn under clothing and not easily accessible. If any of the conditions aren’t met security can refuse admission. The change was brought about because a study conducted by the security officials found that there are very few incidents where a kirpan was used as a weapon.